St. Jude Medical has enrolled the first patients in its European LEADLESS pacemaker observational study, designed to build additional evidence to support the safety profile of the Nanostim leadless pacemaker in patients indicated for ventricular single chamber pacing. 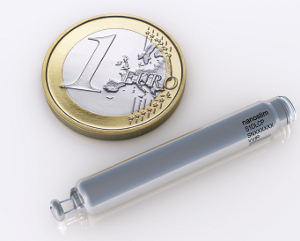 The European post-approval trial has been designed to provide long-term data about the Nanostim leadless pacemaker and will seek to demonstrate additional information about the long-term performance of the device. The study will be conducted at about 100 centers in Europe and will enroll up to 1,000 patients. St. Jude Medical has designed pacemaker to achieve the same pacing results as a standard pacemaker. The pacemaker is less than 10% the size of a conventional pacemaker and implanting process of the Nanostim leadless pacemaker is quite different from standard pacemakers. Nanostim leadless pacemaker is delivered using a steerable catheter through the femoral vein, eliminating the need to surgically create a pocket for the pacemaker and insulated wires (called leads). The pacemaker has been designed to be fully retrievable so that the device can be readily repositioned during the implant procedure and later retrieved if necessary. According to St. Jude Medical, the device battery is expected to have an average lifespan of more than nine years at 100% pacing, or more than 13 years at 50% pacing. St. Jude Medical Merlin Programmer has supported the device. St. Jude Medical chief medical officer and global clinical affairs vice president Dr Mark Carlson noted the company’s European clinical trial aims to further demonstrate how the Nanostim pacemaker improves patient outcomes and implant procedure efficiency through its minimally-invasive design. "We are delighted to see this groundbreaking technology enable physicians to improve the lives of patients worldwide," Dr Carlson added. In 2013, the Nanostim pacemaker obtained CE Mark approval and post-approval implants of the device have occurred in the UK, Germany, Italy, Czech Republic, France, Spain, and the Netherlands. Initial results from the LEADLESS trial were presented in 2013 and demonstrated overall device performance comparable to conventional pacemakers. Total implant procedure times averaged 28 minutes. St. Jude Medical has announced the first US implant in February 2014 in the LEADLESS II pivotal trial. The LEADLESS II pivotal trial has been designed to assess the Nanostim leadless pacemaker for US Food and Drug Administration (FDA) approval. The LEADLESS II pivotal trial, which is being conducted under an Investigational Device Exemption from the FDA, will enroll approximately 670 patients at up to 60 centers across the globe with up to 50 sites in the US. Image: St. Jude Medical’s Nanostim leadless pacemaker is less than 10% the size of a conventional pacemaker. Photo: Courtesy of BusinessWire/ St. Jude Medical, Inc.